A perfect buy to let or ideal first time purchase with manageable outside space and well presented, neutrally decorated living spaces over two floors which is UPVC double glazed and electric storage heated. 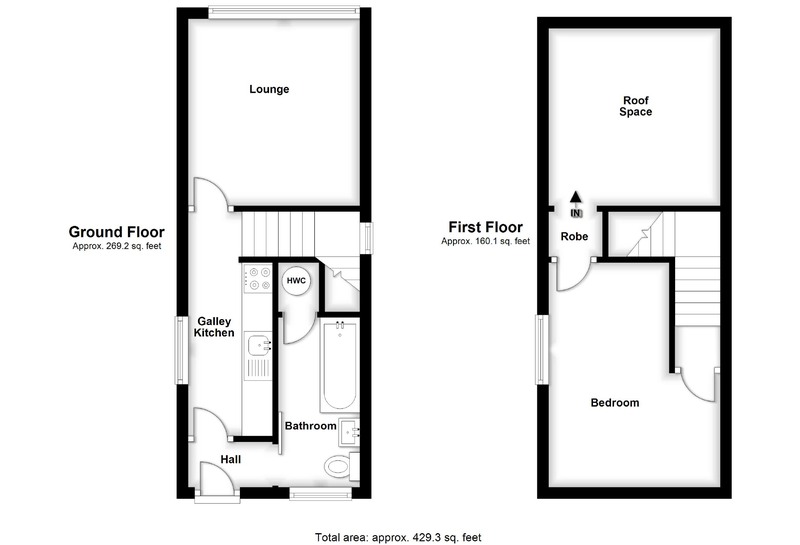 The property has been attracting a rent of just under £500 per calender month and offers a small hall area, bathroom, kitchen and lounge to the ground floor with first floor bedroom and storage. On street parking available outside and offered with no upward chain for immediate vacant possession. Epc Rating - An EPC (energy performance certificate) has been carried out on this property with the resulting rating E. For a full copy of the report visit www.EPCRegister.com and search using the postcode for the property. Ground Floor Bathroom - 2.99m x 1.36m (9'10" x 4'6") - With a three piece white suite as pictured comprising panelled bath with mains fed shower unit and full height tiling, pedestal wash basin and low flush WC, electric storage heater, UPVC double glazed window to the front elevation and door off to a useful airing cupboard containing the property's lagged immersion cylinder with two slatted shelves above for storage. Lounge/Diner - 3.52m x 3.02m (11'7" x 9'11") - With electric storage heater, ceiling light point and UPVC double glazed panel/window to the rear elevation. Wardrobe - With hanging rail, shelf and low level hatch leading off to the roof space with water tank and insulation. Outside - The property is accessed via a shared paved area sat back from Lower Cambridge Street itself with a mature laurel bush to the corner of the plot. The outside space consists of a slabbed/tarmac pathway which surrounds the side and rear elevations with a low level wall leading to a narrow elevated garden space with a variety of mature shrubs and plants, as pictured. Plot Plan - This plot plan shows a rough approximation of the property's plot and cannot be replied upon to form part of the contract. Purchasers should make their own enquiries via their legal advisor should they wish to know exact boundaries.